Bogola Head (2015) by Andrew Sayers, gouache on paper, 57cm x 76.5cm. Good Weekend readers will have spotted John McDonald’s review of our current exhibition of gouaches by Andrew Sayers as reproduced below. The evocative landscapes, with a beautiful sense of space and place are on show until 27 April. 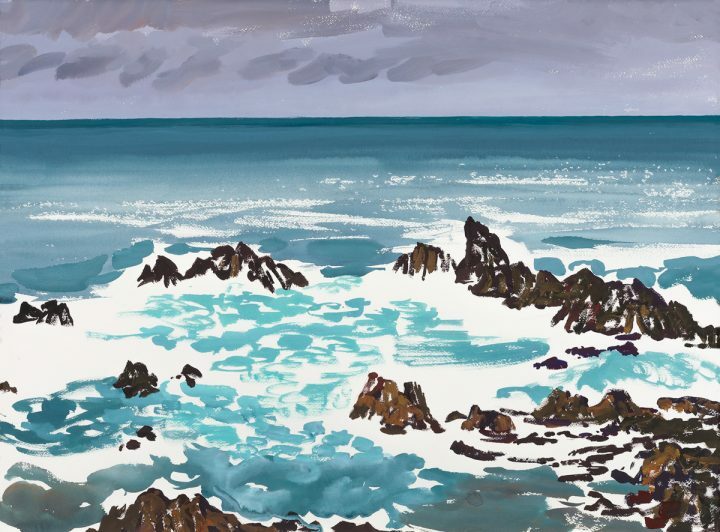 His thing: Gouache on paper landscapes, painted in a range of locations. Our take: After establishing his reputation as a curator at the National Gallery of Australia, Andrew Sayers went on to become the founding director of the National Portrait Gallery and, later, director of the National Museum of Australia. Only a few close friends knew that Sayers was also a secret artist who took every opportunity to go painting “en plein air”. Sayers had long intended to give up museum work and devote himself to artistic activities, but when diagnosed with pancreatic cancer, he began to value every moment he could spend with a brush in his hand. He held a first solo exhibition with Lauraine Diggins Fine Art in May 2015, and died in October that year. Andrew Sayers: Defining the Artist is his second solo show with the gallery, featuring goauche landscapes drawn from the estate. The quick-drying nature of gouache encourages a rapid response, and many of these works on paper might be described as sketches in which the artist has spontaneously jotted down his impressions. Other pictures are more considered, but it’s obvious that Sayers relished the challenge of painting at high speed, relying on eye and instinct. Like all dedicated landscape artists, he would return to the same motif again and again, investigating it from different angles under varying qualities of light. The works in this show range from $1500 to $5000, depending on size. The smallest, such as On the Spot Sketch, Wallaga Lake Bridge (2012), are 23cm/24cm x 32cm. The largest, such as the diptych Wooden Bridge (2010), are 57cm x 76cm and priced at $4950. Another large work is Bogola Head (pictured). Where can I have a squiz?